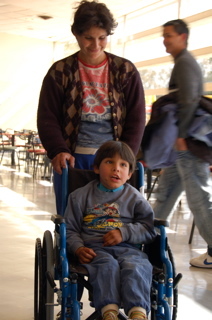 Back in June I posted a blog entry which mentioned a little boy in San Marcos village whose mother had spent several years trying unsuccessfully to extract a wheelchair from local social services. Through a contact of a friend of another contact of another friend (this is Argentina! 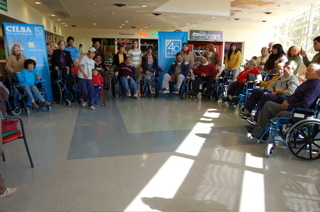 ), we managed to establish a link with the Córdoba branch of a national organisation, Cilsa, who are involved in various disability-based projects, including providing wheelchairs and other equipment. We then had to present a pile of paperwork, documents, measurements, and photos to prove that Isma is entitled to a wheelchair, and to determine the size that he needed. Last week we received a message to say that the chair was ready, and to invite Isma and his mum to come to a group presentation today. On Monday night I travelled out to San Marcos. Yesterday morning I visited the family and arranged the trip. Today we set off early to catch the bus to Cordoba. Funny the little things that one doesn’t think about… I hadn’t imagined that Isma has probably never been to a big city before. He loved the buses and lorries, and he laughed and laughed when we took him on the escalators in the bus station! Cilsa were giving out equipment to about twenty recipients and they had made a little event out of it, with celebratory cake and music. Our wheelchair was the smallest in the line. Isma seemed quite pleased with it, and I would estimate that it will take him all of about five minutes to figure out how to make it work. Having saved his mum’s back on one hand, we have probably given her a whole new set of things to think about, starting with child-proofing the house, and issuing shin-guards to the rest of the family. We’re back! Thanks very much to the people who contacted us to let us know that our blog was down. Now we know that there are more people reading it than we had imagined! This encourages us to keep writing it. Isaias, aged two, is prodding my abdomen. “There’s a baby in there” he announces, with all the authority of a toddler displaying his superior knowledge. Kevin, aged three, is scandalised. “Have you eaten a baby?” he accuses. Ex-war correspondent Kate Adie chooses “The Kindness of Strangers” as the title of her book. It is also a quote from a play, but don’t ask me which one; it’s a while since I did English literature. I found myself thinking about it at seven o’clock the other morning, lying in a strange bed in a strange house, where I had been invited by people whom I had only met the day before. I arrived in the little town of Pichanal in darkness at ten o’clock on Wednesday evening. Pichanal looks like a dive by night, and is not greatly improved by day-light. Situated on the cross-roads of two major routes south from Bolivia, its reasons for existence mostly include drugs and contraband. The man in the bus ticket office gave me directions to the one hotel. The people in the hotel welcomed me. Actually they seemed a bit confused to see me. I realised at breakfast the next morning that the other residents were all male Argentinians, migrant factory workers, and I guess they don’t see too many lone pregnant foreign females. But the sheets were clean, and the shower was hot, and to be honest, that’s about the extent of my accommodation requirements. The next day, I walked to the school, where I was received as an honoured guest. Groups of children dressed up and performed little plays and dances in my welcome. One of the teachers showed me round the indigenous (Guaraní) community which the school serves. Another teacher invited me back to her house at lunch-time, and yet another came and took me back to school for the afternoon. Afterwards I caught a ride to Oran, another larger settlement. Here I was met by a speech therapist, who showed me round the city, and invited me back to her house for the night. In the morning, the same lady took me to a children’s home, and on to another school, where we were warmly received by more welcoming strangers, even though we had showed up unannounced on the off-chance that someone would be available to show me round. Lunch-time, and again I was invited home, and fed a mountain of spaghetti and sauce, before being given a lift on the back of a motorbike to catch the bus back to Salta. In a world where “man’s inhumanity to man” is given a hyper-inflated status for being the more news-worthy, maybe it’s time to celebrate the real value of so many un-noticed instances of “the kindness of strangers”.